Sometimes my favorite blog recipes are the ones that I don’t make for the blog. This is one of those times. The tang of the tomatoes, the chewy whole wheat pasta, the tender-crisp baby broccoli, the creamy melted feta + the firm crumbly feta, plus the freshness of lemon, basil, and pesto. I mean, this is the whole flavor, color, texture, and nutritional package. AND 20 MINUTES. Read it and weep. Er, happy weep. I made this last Sunday night on a whim, when what I had really wanted for dinner was a frozen pizza but come to find out we had eaten all 47 of our frozen pizzas. Hmmph. Bjork suggested ordering a pizza like the good husband that he is ❤, but a) I couldn’t wait that long and b) I wanted something that had a tiny bit of redeeming nutritional value. For us, ordering a pizza means adding a large order of cheesy breadsticks means food bliss dipped in marinara means zero self control in the best/worst way possible. So in order to avoid the pizza situation, the emotional roller coaster that comes along with being HUNGRY RIGHT NOW, I searched the cabinets for some quick dinner ingredients. Which can always be a little interesting, if your kitchen is anything like mine. Three boxes of the same pasta, half used jars of things, half of a lemon in a baggie in the fridge, that sort of thing. Luckily I had bought a little bunch of baby broccoli and never used it before we left for vacation, and by some miracle, it was still crunchy after hanging out in the fridge for a week while we roasted in the sun. Judge me. I dare you. Luckily also I have a storehouse of pasta in which I found a half used bag of whole wheat penne pasta. Thank you, self, for being scrappy. And to add to my dinner luck, we also just got a Costco membership, and during one of my recent trips I loaded up on mass amounts of things I NEEDED like Mediterranean jarred foods because: saaaalty. Kalamata olives, artichokes, and oven roasted tomatoes galore. We should be good to go for the next 18 years. I opened the fridge looking for inspo and that brand new, barely used, extra jumbo jar of oven roasted tomatoes stared me right in the face. It was like the food universe was speaking to me. ALL THE SIGNS. Again with the impromptu kitchen findings: a half of a lemon. a little bit of feta cheese. an open jar of pesto. BAM. No frozen pizza, no delivery pizza (but just you wait – Friday’s a-comin) and a healthy homemade bright and colorful vegetarian dinner on the table in 20 minutes. WIN WIN WIN! So there we sit, eating double servings of this simple and quick lemon pesto penne, and Bjork is mouthing the words “this is the best pasta you’ve ever made” but I can’t even hear him because my face is buried in tangy oven roasted tomatoes and crunchy broccoli and chewy pasta. Bjork’s memory for food isn’t quite the steel trap that mine is, and I’m think he miiiight have forgotten about the Healthy Fettuccine Alfredo and also the San Marzano Pasta eFagioli, but I’ll take what I can get. 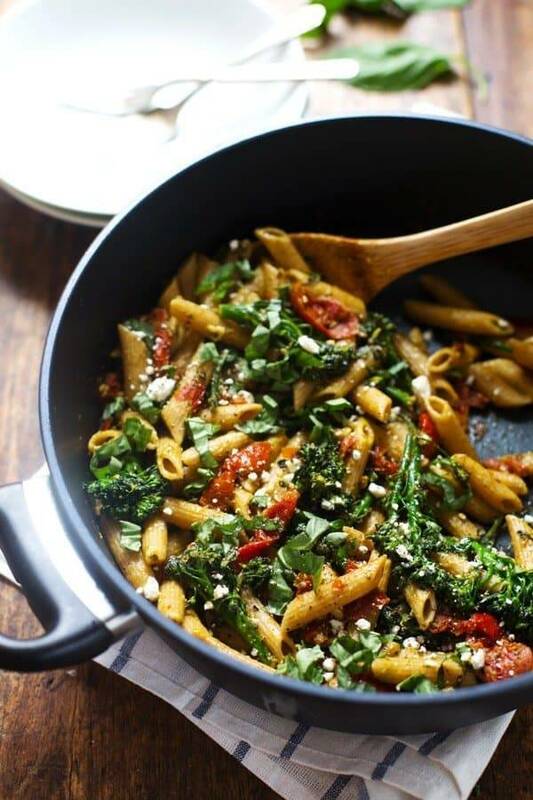 I made this on Sunday, it was a major win on all levels, so I made it again on Monday with a few extras like fresh basil and fresher baby broccoli. And I might make it again tonight. I think 20 Minute Lemon Pesto Penne tunnel vision is what they call it. End of story. 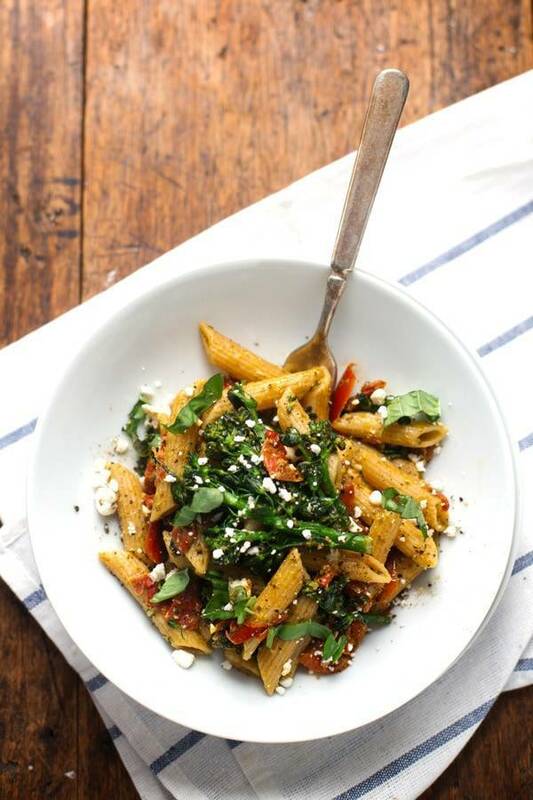 This 20 Minute Lemon Pesto Penne is my husband’s favorite pasta! Baby broccoli, oven roasted tomatoes, and fresh lemon and basil. Cook the penne according to package directions. Add the baby broccoli to the pot of boiling water for the last 1-2 minutes of cooking. It should turn bright green. Drain and return to the pan over medium high heat. Add the tomatoes and garlic to the pan with the pasta and baby broccoli; saute 1-2 minutes or until fragrant. Add the pesto, half of the feta, and the lemon juice. Toss in the pan until well combined. Remove from heat and add the basil. Sprinkle with remaining feta before serving. 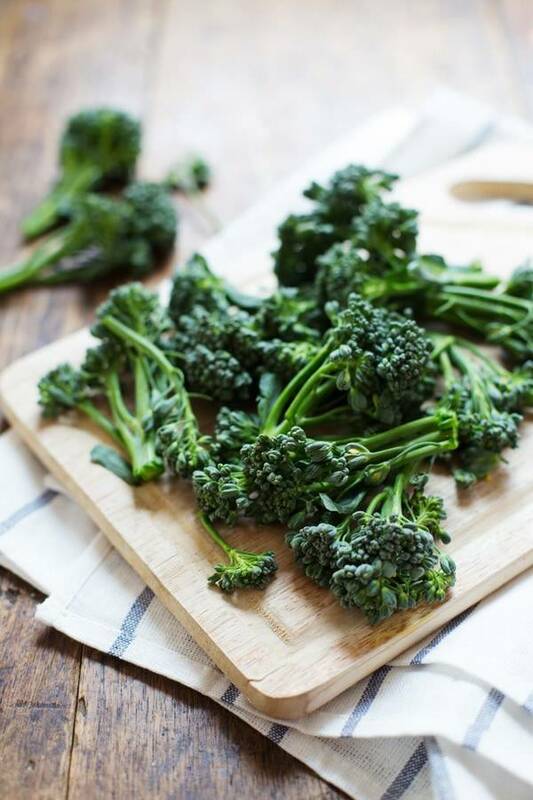 You could also use regular broccoli, broccolini, or broccoli rabe (all have different flavors and textures but I think they could all work). This dinner looks so good. I can definitely see why it was such a hit!! Looks deeelish! I do the exact same thing at Costco and buy jars and jars of kalamata olives, capers, artichokes, but I have not seen these oven roasted tomatoes you speak of 🙂 I must find them! Hi Lindsay, Thank you so much for your quick response to my questions for my paper. This recipe looks wonderful! I’ve been a vegetarian for a few months now, which is how I found your website, and can’t wait to try this recipe. I love feta cheese! Wow!!! This is making me so hungry. I can’t wait to try it (minus the cheese)! I love making my own roasted grape tomatoes in the oven with garlic and olive oil, and right now I have some lemon garlic olive oil that will go perfectly with this. Thanks so much! can you tell me just where you got the pesto? because i want to make it just. like. yours. it looks delicious!!! I adore these kind of meals, really we all probably have most of the ingredients in our pantry and fridge it just is realizing that most times we need to remember simpler is better. Love the color! Hey Girlfriend, I’m with all the way on this one. I like 20 minute lemon pesto penne tunnel vision! Bring it on! Looks so delicious. And healthy. And hearty. And and — I love it. 20 minutes?! That is incredible! This look so delicious, and is full of so much flavor. What a perfect dinner. Pinning! Not sure why but your “steel trap” comment totally got me. Probably because it’s totally true at our kitchen table too, where I am constantly quizzing Eric on questions like which dish he liked best in 2012, and he looks blankly across the table at me. This looks amazing. I’ll have to work around the basil pesto because of my freak fresh basil allergy, but this looks delicious enough to make it worth the effort! Right? and then we’ll drive by a restaurant we went to like 8 years ago and I’ll comment on what a great Caesar salad they had and how good the homemade croutons were. SO so extremely different! Umm….. this looks amazingg! Definitely bookmarking this one! I made this tonight after seeing it on Buzzfeed. It’s my favorite new pasta recipe… thank you! I’m going to drift happily into a Lemon Pesto Pasta coma now! Buzzfeed! Yay – I’ll have to check it out. Thanks Jeannie! I found this recipe on Pinterest and couldn’t wait to try it. The only subbing I did was using sun dried tomatoes in olive oil instead of oven roasted. I sauted the tomatoes with the garlic first and then add everything else. Great flavors and my husband really liked the chewiness of the tomatoes. Thanks! Nice swap – I always go for sun dried tomatoes in oil. The texture/taste is so much better! This pasta was deelicious!! I had never heard the term “baby broccoli” so I wasn’t sure if I would be able to find it at my local grocery store. Lo and behold… it seems to be the same thing as Broccolini. I followed the recipe pretty much exactly… except I had to turn this 20 minute pasta into about an hour pasta. First, I couldn’t find oven roasted tomatoes so I decided to make my own. It was super easy, I just googled a recipe and ended up following Ina Gartens. Then I couldn’t find any quality pesto so I went ahead and made my own as well. Even though this all took some time – the results were amazing and I will definitely be making it again. I can’t wait to have the leftovers for lunch! The pasta really was super fast to come together once the tomatoes and pesto were ready. This looks so fresh and delicious, who wouldn’t love pasta with lemons, broccoli, garlic, feta (although I’m weird on that one and have to have cow milk feta). Looks fabulous, I must try this! Made this last night for a crowd and it was a huge hit! Definitely a new favorite – thanks for sharing!! Made this today for my family! Took a bit longer than 20 minutes, because I oven roasted my own tomatoes (I couldn’t find premade) and made my own pesto because my mother is allergic to pinenuts and it’s hard to find pesto in a jar without them or cashews(??). But it was definitely worth the effort, it turned out great and the lemon and feta really adds to the dish. Thank you! Making this again soon! this looks amazing! do you have a recipe for homemade pesto? This looks amazing, can’t wait to try it. How many servings does it make, based on your nutrition table? I am doing weight watchers so I want to make sure I calculate the points accurately, thanks!